Fights anything, anywhere. Supports banking, potions, food, abilities, and custom looting. The Refresh button will populate the "Available Npcs" list with the Npcs in the area. The spinner to the right is the radius. This sets the area that it will scan for Npcs in. 10 = all Npcs within 10 tiles of the player. 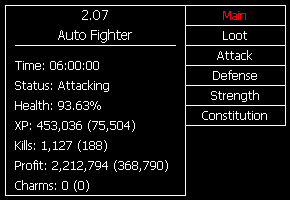 This value does not have an affect on the actual script; it is only for populating the list for Npcs to attack. The "Available Npcs" list is a list of available Npcs. Click on an entry to move it to the "Selected Npcs" list. The "Selected Npcs" list is the list of Npcs that you will be attacking. Double click an entry to remove it from the list. Select the food you'd like to eat from the list. Most common foods are supported. Set the percentage of health you'd like to eat at. 30 = eat at 30%, 50 = eat at 50%, etc. Select the potions you would like to drink. Attack, strength, defense, and prayer potions (and their supers) are supported. Set the value to drink each potion at. 80 = drink whenever the level falls below 80, 90 = drink when it's below 90, etc. For prayer, it's the value times 10 (i.e. 80 = drink below 800, 90 = drink below 900, etc). Select to eat to make room for loot. If your inventory is full, and there is loot on the ground, this will eat a piece of food to make room for the loot. Drop items that don't match loot settings, i.e. will drop trash you didn't mean to pick up. Select whether or not you'd like to use a teletab when you run out of food (for safety or whatever else). Debug GroundItems. Will paint the name, ID, stack size, and price of all items on the ground. Select whether or not you want to use abilities. Select to use Rejuvenate or not. Will Use when health falls below 60%. For shield swapping, input the ID of the shield you want to use for Rejuvenate. The ID of the weapon to equip when not using Rejuvenate. Select to Alchemize items. Will cast low or high alchemy. Have the spell on your action bar. 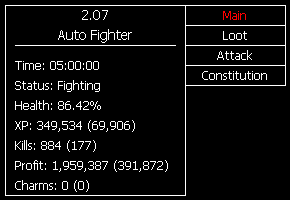 Enter the IDs of the items you want to alch, separated by a comma. 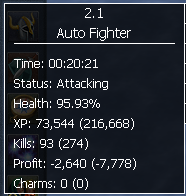 Toggle quick prayers. Will enable quick prayers while you're in combat, disable otherwise. Select whether or not you want to use summoning. If enabled, it will automatically renew its points at an obelisk if one is near, or drink a summoning potion in your inventory if one is not. Select the familiar you want to use. The list of items that you will be looting. You can press the "+" button to add items to the list. 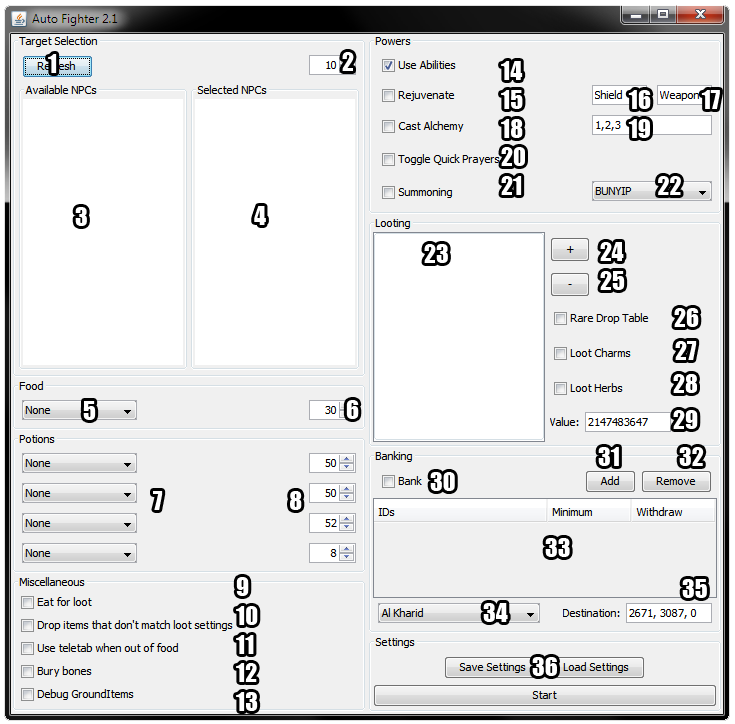 Press the "-" button to remove the selected item from the list. Rare Drop Table will add all items on the RDT to the loot list. Select if you want to loot charms or not. If selected, it will add charms to the loot table. Select to loot Herbs. Will add all herbs to the loot list. Loot all items over... 100 = loots all items worth more than 100 gold, 1000 = loots all worth more than 1000, etc. Select whether or not you want to bank. If enabled, it will go to the set bank (below) whenever it is out of items or your inventory is full. It will deposit your items and withdraw anything you've specified. Select the "Add" button to add an item to the "will withdraw" list. You will be prompted with a popup asking for the the item's ID, the minimum amount required (will bank if it has less than this), and how much to withdraw (how much to withdraw when banking). You CAN edit these values after you've added them (double click on the table). The table of items you'll be banking. Select the bank you want to use. Obviously the one closest to you is best. The "Destination" is where you want to fight. When you start the script, it's set to your current location, so if you start the script at the monster you want to fight, it will be set for you. You can save and load settings so you don't need to fill everything out every time. It's pretty self-explanatory. Does this support [some dungeon]? The list of supported dungeons is listed above. If you don't see it listed, it doesn't support it. You can request it and I may add it. Does this support [some feature]? All supported features are listed above. You may request new features, and I may add them. Why does the script attack slowly? When you are looting, the script will wait for the target to completely die and go through the death animation. This is to ensure that you don't lose any loot, since loot is prioritized. If you are powerfighting (not looting) and the attacks seem slow, it is because you did not add all of the variations of the target's IDs. Increase the search radius and be sure to add all of the target's IDs (the IDs are shown in parenthesis). There is a complete "how to" in the spoiler above. It covers every aspect of the UI. Best of luck with your new script, sorry to see you got demoted though. I do wish the decision is revoked. Posting in a rare [member=Coma] thread. He will be admin again. Hes too good to stay demoted forever. Do you have plans for traversal paths? It could be hard-coded with some default mappings. Create some object, namely TraversalObject which brings people to a certain location. This would be agility shortcuts, doors, teleports and even just tiles. That's how Whitebear implemented his and it was pretty light-weight. I meant as in a small XML file regarding a highly-request path, one that people would vote to be included in default options. Did you test it already ? And how long did you bot with it ? I botted for about an hour with it the other day. 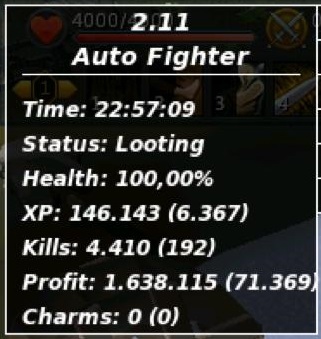 "Loot all worth over" now works for noted items. You can get the IDs from the Runescape website. It's more reliable by ID. But may start a list of commonly looted items and list their IDs.